Over the course 2014 and 2015, I implemented and led Wrap Your Head Around It: a collaborative and interdisciplinary arts project that linked text textile through community action. Ultimately, 200 hand dyed and printed scarves were distributed through cancer support organizations directly to cancer patients, caregivers, and survivors. How did Wrap Your Head Around It work? This collaborative textile experience began with guided writing sessions and ended in wearable art. The many stages included: writing sessions; surface design workshops; scarf construction; public gallery exhibition; and scarf distribution. Partnerships were wide ranging and included medical centers, colleges and universities, textile business, art galleries, and cancer support groups. Under the direction of poet Grey Brown at Duke University Cancer Patient Support Programs, cancer patients, caregivers, and survivors explored personal narrative and collective experience through writing. Excerpts and phrases from group poems were borrowed and adapted as “community word offerings” for use as text on fabric for scarves. 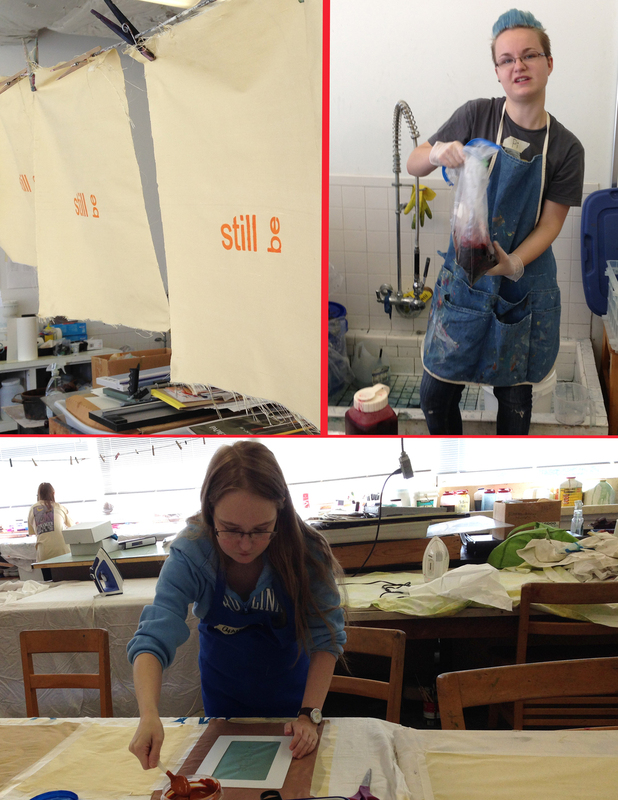 I facilitated multiple sessions of dye and print workshops in which participants helped prepare silk with color, pattern and “community word offerings.” Partnering groups in surface design workshops included: art students at Meredith College, North Carolina AT&T State University and Elon University. Community artists from the NC triangle region, WRAP Kickstarter supporters, and cancer community members also participated. Semi-private workshops were also held in my studio. I conducted multiple stitching sessions with experienced textile artists to piece together the scarves. 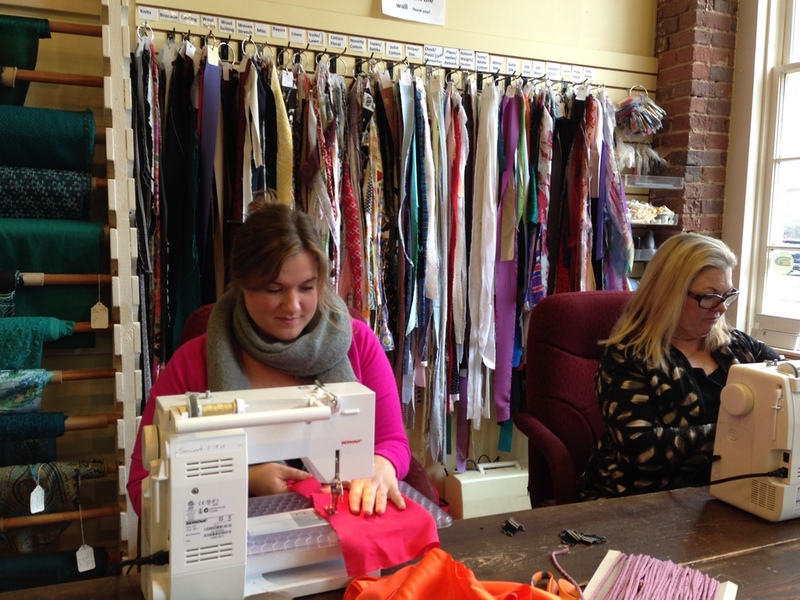 Community stitching workshops were held at Mulberry Silks & Fine Fabrics in Carrboro, NC and at Spoonflower, a custom fabric and design business, in Durham, NC. Public exhibitions of sixty of the finished scarves were mounted—in banner style display along with multi-media documentation of the entire project—at Frank Gallery in Chapel Hill, NC and at Duke Hospital in Durham, NC. 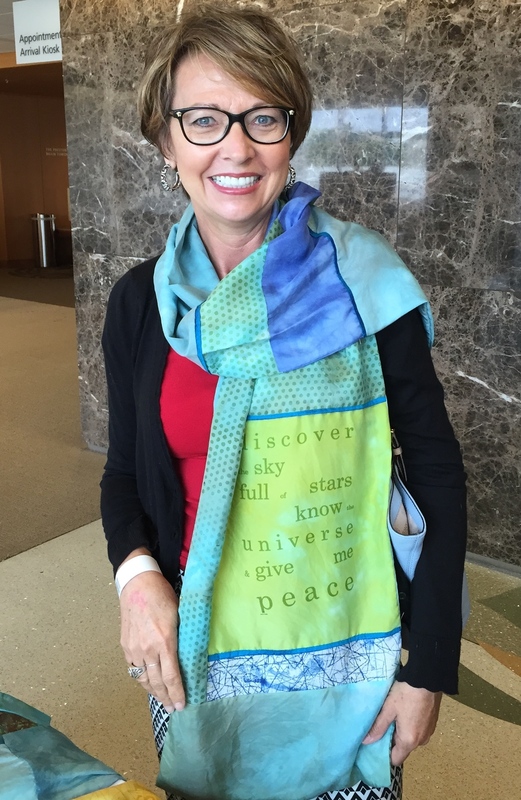 Scarfs were distributed to individuals in the cancer community in a variety of ways: social workers at the Duke Cancer Support Center worked to identify individual recipients of scarves through a registration process (adhering to HIPAA regulations); each participant in any stage of creations (writing, dying, printing, stitching) was able to register to assign a scarf to a cancer patient or survivor or caregiver they were personally connected with; and scarves were distributed through Sisters Network Triangle NC and Cornucopia House, two community-based cancer support organizations.